LINK is a set of Environmental Systems Research Institute (ESRI) ArcGIS tools designed to analyze habitat patterns across a landscape. LINK is the latest product from a series of Decision Support Systems (DSS) that uses species habitat matrices to model potential species habitat and habitat diversity. What sets LINK apart from its predecessors is that it uses raster data sources. Raster data sources allow LINK to model habitat over a much larger area than its vector based ancestors. LINK’s main purpose is to make comparisons of conservation potential between management units and the surrounding landscape. LINK does this by summarizing potential species richness, habitat diversity, and habitat composition. There are three main data sources needed to run a LINK Query. 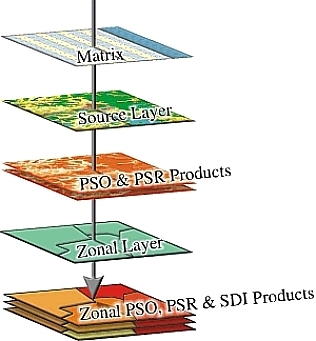 These data sources include matrices, source layers, and zonal layers (Figure 1). habitat using a zonal layer. You can generate several analytical products of potential habitat with a single LINK Query. A user can query for an individual species or a group of species. The matrix related to the source layer has habitat suitability scores ranging from 0 (little to no value as habitat) to 100(prime habitat). For each cover type within the source layer there is a corresponding column within the matrix (Figure 2). The Relationship Manager allows the user to create an association between matrices and source layers, and between source layers and zonal layers. The source layer is a raster spatial data layer that contains landscape information for the species listed in the matrix. The source layer must be an integer ESRI Grid (e.g. National Land Cover Dataset). A zonal layer is an ESRI Shapefile used to divide the landscape into units of comparison. Counties within a state or management units within a refuge are examples of zonal layers. Download LINK (371 MB, February 23, 2010) LINK is currently available for ArcGIS 9.3. LINK allows for regional analysis of habitat suitability, habitat diversity, and species abundance. This is an explorative tool to be utilized by land managers to strategize conservation effort.